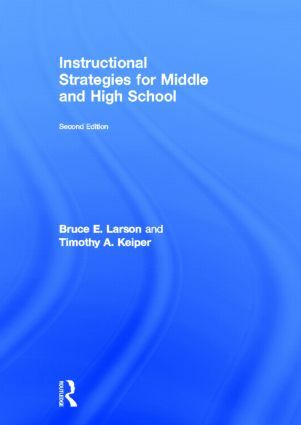 Instructional Strategies for Middle and High School is an accessible, practical, and engaging methods textbook that introduces pre-service teachers to various instructional strategies and helps them to decide how and when to use these methods in the classroom. Classrooms are comprised of diverse learners, and aspiring teachers will face complex decisions about the assessment of student learning and classroom management. Veteran teacher educators Bruce Larson and Timothy Keiper offer practical suggestions for ways to integrate effective classroom management and valid assessment techniques with each instructional strategy. Instructional Strategies for Middle and High School equips pre-service teachers with the methodological tools to promote understanding, conceptual awareness, and learning for every child in the classroom. Fully revamped and comprehensive companion website, with both student and instructor materials that stress real-world application of strategies, classroom assessment and management. This book breaks the mold of traditional secondary methods texts. Readers will feel empowered as they connect and apply content through the "guidelines" and "step-by-step procedures" sections in each chapter. The succinct chapter reviews, graphic organizers and bullets make this text reader-friendly. The balance of these great attributes makes it a practical and long-awaited resource. I am pleased to see this text retains its strong focus on lesson design in its second edition. Instructional Strategies for Middle and High School serves as an excellent bridge from what my students initially learn in previous courses to what they must master in terms of curriculum design in my secondary methods course. Quite often, texts such as these suffer in their "readability" for college students who are grasping (for the first time) some of the nomenclature and terminology of the field. This text provides the necessary information in a manner that is usable for a student beginning his or her professional coursework. Bruce E. Larson is an Associate Professor of Secondary Education and Social Studies at Woodring College of Education, Western Washington University, Bellingham, WA, USA. Timothy A. Keiper is an Associate Professor of Secondary Education and Social Studies at Woodring College of Education, Western Washington University, Bellingham, WA, USA.